By now, the members of the US Senate have received an FBI report on their findings as to the allegations of sexual misconduct against President Donald Trump's Supreme Court nominee, Mr. Brett Kavanaugh. Although Republicans and Democrats remain bitterly divided on whether to approve Mr. Kavanaugh as a Supreme Court judge, it is widely expected that a vote will be held this Saturday which Republicans can win based on a 51-49 majority in the Senate. Even if they lose 1 and get a 50-50 vote split right down the middle, the GOP knows that Vice-President Pence will carry the remaining vote needed and give them a 51-50 total. The only problem is, do Republicans get to the votes they need to get their man on the bench? 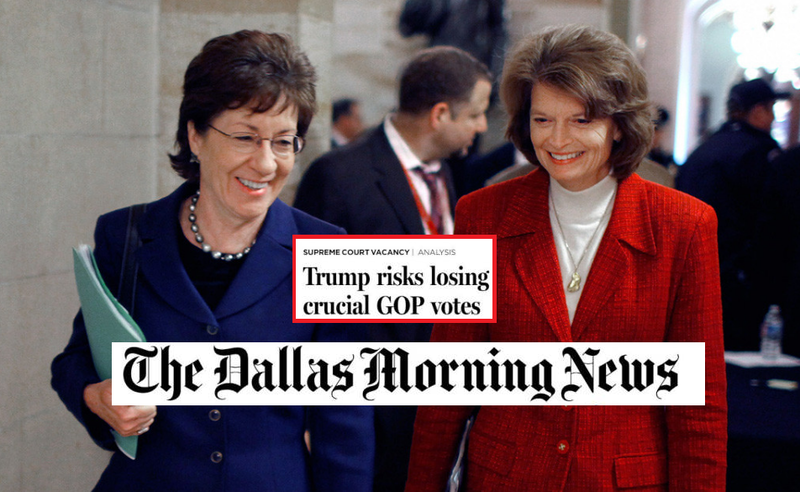 There are three Senators everyone is looking at: Ms. Susan Collins, Ms. Lisa Murkowski and of course, Mr. Jeff Flake. Ms. Collins hasn’t come out publicly to say how she will vote just yet, but her comments on President Trump’s apparent mocking of Ms. Ford’s recollection of facts of the sexual assault was called ‘plain wrong,’ as stated by her yesterday. As an abortion rights supporter, Ms. Collins has made it clear in the past she would find it difficult to confirm anyone who opposes Roe v. Wade (the landmark 1973 decision legalizing abortion). "What I want to see is a nominee who, regardless of his or her personal views on the very difficult and contentious life issue, is going to respect precedent." Ms. Collins has in the past dropped the party line on issues like health care. Ms. Murkowski has to make even more tricky calculations when it comes to Judge Kavanaugh. Many Alaskan natives oppose Mr. Kavanaugh's confirmation, given his previous rulings on Native American populations. Furthermore, the Alaska Republican has an independent streak and supports abortion rights. She had hoped for a nominee in the same mold as Kennedy and stated: “My standards for Supreme Court nominees are extremely high." "It is my longstanding practice to carefully scrutinize the qualifications of judicial nominees and to cast an independent vote when judicial nominations come before the Senate." Mr. Jeff Flake is, essentially, the man with no party and no constituency in the Trump era. Although many base Republicans feel he betrayed them by calling the FBI investigation, if it were to exonerate Mr. Kavanaugh completely, he could eventually emerge as a winner. However, and this is most frustrating for Democrats, his loyalty to the Republican Party and conservative morals in the end always seem to take over the Arizona senator. However, as a matter of ideology, Mr. Flake, in the end, wants to put Judge Brett Kavanaugh on the Supreme Court anyway. liberal filth are HOPING that they can drag-out the nomination process past the November mid-terms to give them more leverage to oppose a conservative nominee but this will backfire on them just like their tactics to assault conservatives. Hey Alaska! How’s that senator you elected working out for you? There IS a time and place for that, Sen Flake. No, it's NOT wrong, Sen. Collins. Sen. Murkowski, your standards for veracity in a witness might need to be even higher than your standards for a judge. Go back to kindergarten. We learned about liars there. The President only said what all Americans are already saying around the water coolers. WE the People run this country, not you. You're FIRED.